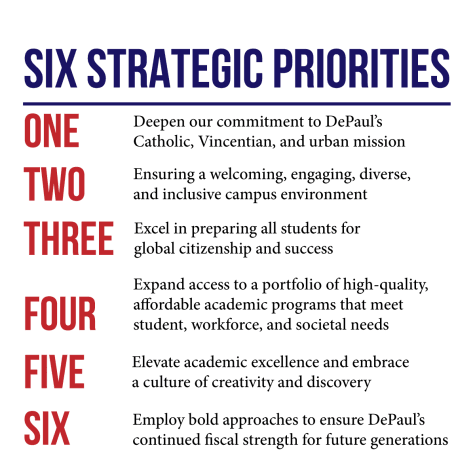 I am going to go out on a limb here and guess that most of you probably didn’t get a chance to read DePaul’s newly released 16-page Strategic Plan over the weekend. Well I read the document, in its entirety, and I think DePaul got a lot right: Elevating our academic profile and growing our endowment are excellent goals. But there is still a lot that I think they are missing. Granted, I only had a one-week deadline and I was lacking an entire task force, but here is what I wish DePaul would have addressed in the six-year plan. The DePaul administration has been somewhat on the fence over this issue, and from what I can tell, the majority of DePaul students favor a community that encourages discourse. It also seems to be one of the only points of agreement between the campus Republican, Democrat and Socialist groups. And students in general want the right to peacefully protest or simply not show up — just look at what the students at UIC were able to do with R. Kelly. Holding debates between all sides not only helps us grow, it helps us to see inside the minds of those who are different from ourselves. I’d argue that hearing from someone with racist ideas can still be valuable in order to understand where your enemy is coming from. I know DePaul has collaborated with the University of Chicago when it came to crafting our “guiding principles for speech and expression” (which sounds like a document straight out of a George Orwell novel), but I think we should adopt UChicago’s staunch commitment to allow all speakers, providing they do not incite violence. To that end, hats off to DePaul for reversing its original decision to ban Steven Crowder. I really can’t stand Crowder or his ideas and most of his viewpoints are shortsighted, but there is no threat of violence there. Ultimately, the term “free speech” is found nowhere within the six-year plan. Going forward, I hope our future at DePaul is one of spirited debate and conflicting ideologies. I welcome the discourse, and so should you. The words “security” and “safety” are not used once within the entire Strategic Plan. In the wake of this weekend’s shooting in Texas, along with the shootings happening regularly in Chicago and on school campuses nationwide, it is ridiculous to not address these concerns. DePaul is one of the only colleges in Illinois without an armed guard in a country where 90 percent of campus guards on colleges are armed, according to the Bureau of Justice Statistics. I served as a Marine and was trained in security — some might even consider me an expert on this topic. But guess what? It doesn’t take an expert to realize that anyone could walk right past the tired, underpaid, overworked guards at 14 E. Jackson with an AR-15, take the elevators straight to the 11th floor and massacre students who are learning behind giant glass windows. I really want DePaul to test the response time of officers to blue boxes throughout campus; It’s something that DePaul should be testing and improving constantly. They should also publish the results so the DePaul community can be sure we are being protected by properly trained personnel (When asked by the DePaulia about testing response times, a university spokesperson flat out ignored the question). That is untrue. I have never been able to go past the guards at 55 E. Jackson, where the upper-level administration works. On the day we interviewed President Esteban at his offices, all of us were required to show our IDs to the guards and sign our name in the logbook. And last week, when I went to human resources to complain about a missing paycheck, the offices were behind a locked door that required a secretary to buzz me in. Our students and faculty deserve the same treatment as the upper level administration. The idea that it just can’t be done is nonsensical. Hundreds of buildings in the Loop are able to keep their employees safe everyday. My ideas? Hire trained armed guards for both of our campuses. I have a ton of veteran buddies that could really use the work. There should also be a requirement that at least one person have a DePaul ID before a group of people travel up in the elevators. Vegas casinos almost all do this, and it works incredibly well at keeping out people who don’t belong. Also, an ID should be required to enter doors through the stairwells. We may not need to implement these strict measures at Lincoln Park (though I would argue we should), but it is a no brainer for our Loop campus. These ideas will not make us completely safe, but they will make DePaul a “hard target,” rather than the “soft target” it currently is, just waiting to be the next national media headline. When it comes to hiring practices, the word “hiring” only comes up in the document twice, and both times concerning diversity. That is pretty ironic considering someone hired Jen Kramer as the new Director of University Events. Kramer was found to have racist and transphobic tweets on her account. 2). The hiring manager knew about the Tweets and didn’t care. I personally believe it to be the first option, and incompetency seems to be the culprit. Anyone with a basic level of competency would at least tell Kramer to delete the Tweets after hiring her. And where are all the usual champions of diversity and inclusion at DePaul over Kramer? So far, I haven’t heard so much as a peep. Meanwhile, the DePaul administration will bury its head in the sand and hope another storm passes, and Kramer will continue to keep her job. Speaking of hiring practices, we should talk about the terrible hires made by Athletic Director Jean Lenti Ponsetto. It is laughable she still has her job. Forget the Wintrust deal, just her record alone over the last decade is reason enough to fire her. When you do a job poorly for a decade in any other occupation, you get fired. This is cut-and-dried stuff, DePaul. DePaul wants to double its endowment to $1 billion by 2024. That’s a lofty goal, but creating a winning men’s basketball program would be a great start; Loyola saw a 660 percent increase in donations in March. Again, this is basic stuff. I get emails daily from readers who say they aren’t giving DePaul a dime until the administration steps up and hires the right people. If you build it — in this case, a men’s basketball team, they — fans and with them, dollars — will come. All of these commitments could rectify a lot of the problems that actually were addressed in DePaul’s new six-year plan. I am quite certain 17-year-old kids in Chicago are more excited about Loyola than DePaul right now. So fix the athletic department — right after that pesky NCAA investigation is over. Make the school a safer place and maybe parents out of state will be more willing to send their “babies” to a city school. This antiquated idea that having armed guards would hurt our image is outdated and silly. Parents would respect our commitment to a more secure environment. The new plan calls for attracting even higher caliber students. If we continue to commit to making DePaul a place of discourse, higher caliber students will want to come here. DePaul has so many benefits that make us all call it home. But until the DePaul administration addresses some serious concerns, it will never be able to truly flourish. Many many thanks for such knowledgeable article if you were the windows 10 mobile user then from our website http://changeringtoneinwindows10mobile.com get the process to change ringtone in windows 10 mobile in easiest way.